DIATROL Sugar Balance Formula - Chromium, Hydroxycitric Acid, Gymnena Sylvestre Leaf Powder, Cinnamon Bark Powder, Cinnamon Bark Extract and Vanadyl Sulfate. This powerful formula helps to normalze blood sugar levels. Tip: Helps to bind the sugar so you can reduce the "spike" after eating high glycemic foods. 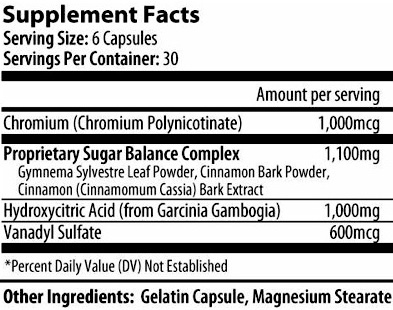 DIATROL SUGAR BALANCE FORMULA - Chromium, Hydroxycitric Acid, Gymnena Sylvestre Leaf Powder, Cinnamon Bark Powder, Cinnamon Bark Extract and Vanadyl Sulfate - formulated to help normalize blood-sugar levels. This revolutionary formula will assist you in maintaining healthy blood sugar levels. More people die from the complications and dangerous side effects arising from the use of drugs to attempt to control blood-sugar levels in diabetes patients than from the condition itself. Even if you don't have diabetes, taking Diatrol when you eat sugary foods, helps bind the sugar and reduces the spikes that eventually lead to insulin insensitivity. Take 6 capsules daily. Suggested 3 capsules with your morning and evening meals. You can take up to 12 capsules daily for 2 months. Then reduce to 6 capsules daily for about 6 months. Some then discontinue the formula totally, while others find that occasional use is best for maintenance. I have tried many, many products to reduce and normalize my blood sugar. I have a damaged immune system from " shots" when I was a small child, thru which I have rheumatoid arthritis and three damaged heart valves. Doctors at that time directly verified this. Now at 61, I have blood sugars sometimes at highest readings when I do not have this product. Others may help a little, but with them I never see under 200. Diatrol, as it is currently formulated, will bring it down and keep it down at a safe level, of course, as long as I behave and stay away from high carbs and sugar. My gratitude goes to those who helped develop and market this product.